NES Mappy (JPN) in 06:03.08 by Spikestuff. 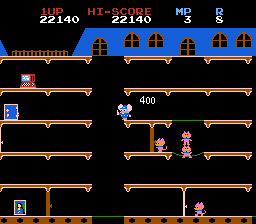 Mappy is a side-scrolling platform game that features cartoon-like animals, primarily cats and mice. The game's main character itself is a mouse. The objective of the game is to retrieve stolen items from the mansions of cats. In this run, Spikestuff completes a full cycle of levels (16 levels) as fast as possible.